I thought last year’s DessertQuestNYC was pretty incredible. We covered 14 places in six hours. Little did I know that nothing compared to what uber NYC food expert Jackie Gordon mapped out this year. With over 20 stops I decided to break this post into three parts. This way you can savor each step without feeling overwhelmed. We started our morning the way so many American do, with donuts. 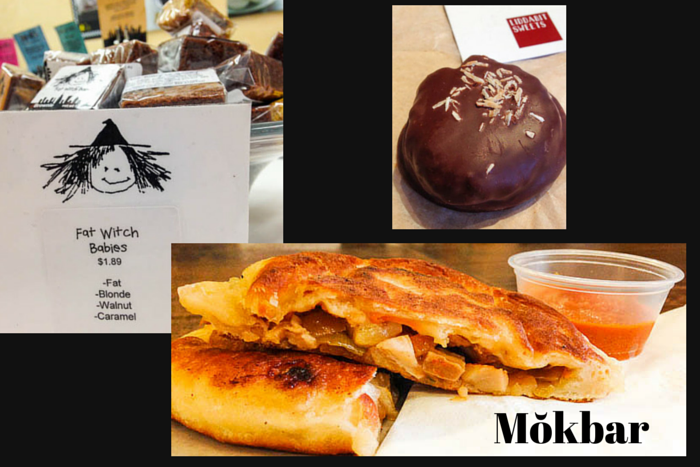 Dough is known for their yeast doughnuts that are baked in small batches throughout the day. Salted chocolate, café au lait and dulce de leche were a great way to start our day. One taste and it was easy to understand why Pastry Chef Fany Gerson is so successful. We only tried the peanut butter and jelly stuffed donut at Doughnut Plant, but only because we knew how many more stops lay ahead. Doughnut Plant claims to have the world’s first square filled doughnut and they are really cool to see. I love that the owner, Mark, used his grandfather’s recipe when he started the business. 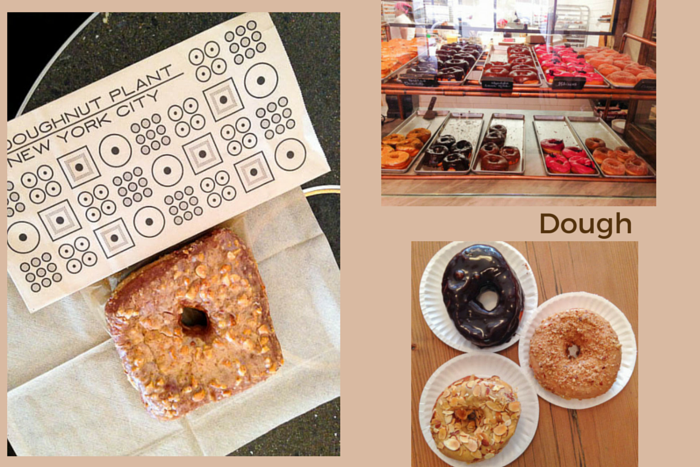 The flavors at Doughnut Plant are a tad more unusual than those at Dough. Harbs is a Japanese bakery where we all shared the Marron Tart, since that was the one in the case that looked like it was being devoured, quickly. We wanted to sit down to eat but there is a minimum order required to do this and our one slice did not make the cut. Instead, we made ourselves at home and camped out in the storefront. Thankfully, we were the only ones there, so it wasn’t a problem. The tart was light and airy, though I would have preferred a bit of the chestnut flavor inside rather than just on top of the tart. Passing by FIKA meant we HAD to stop and see what it means to have a love connection between Sweden and New York as co-owner Lars Åkerlund is from Sweden. The chocolates are divine. Next time I am going to buy a jar of nutty spillevink, which means playful in Swedish. The name suits these chocolate, almond, pistachio, hazelnut and raisin candies. 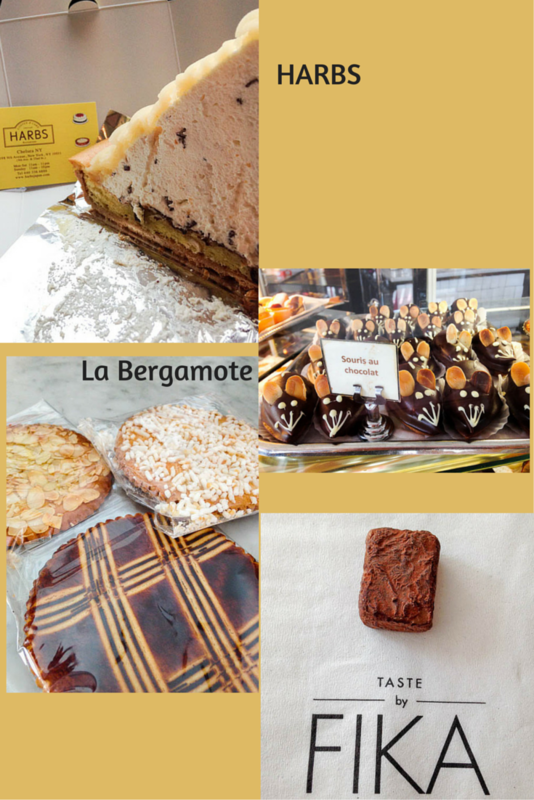 La Bergamote has been satisfying New Yorkers since 1998. The souris au chocolat (chocolate mouse) are adorable; they are lined up as though they are ready to take over the shop. Jackie ordered a sandwich in an effort to ‘line her stomach’ with something other than sweets. It was fabulous and you better believe that I was sorry I did not buy the gigantic butter cookies near the cash register. Huge mistake on my part but that is why the words ‘next time’ are in the dictionary. 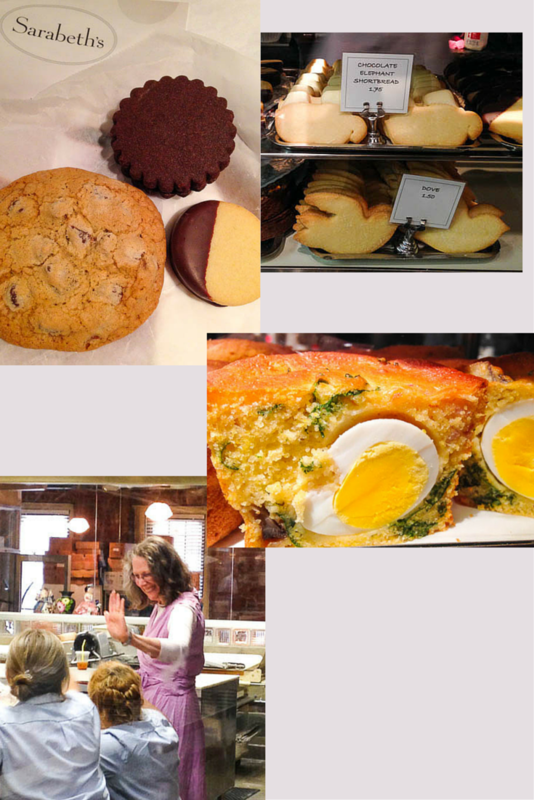 In Chelsea Market we tried a few places. Fat Witch was one of Oprah’s Favorite Things and is known for its variety of brownies. The store sells mini sizes known as Fat Witch Babies and Susan’s recommendation for the Blondie was spot on. Mŏkbar is a ramen shop and home to one of the best pork buns I have ever tried. I did not order one for myself but was thrilled that Jackie, Susan and Ken needed to ‘line their stomachs’ once again. Liddabit Sweets is a Brooklyn born company that makes candies and confections by hand. They are huge advocates of supporting local businesses, something I wish more businesses would do. This was a stop that made me a ‘liddabit’ happy with their Brooklyn made chocolates. 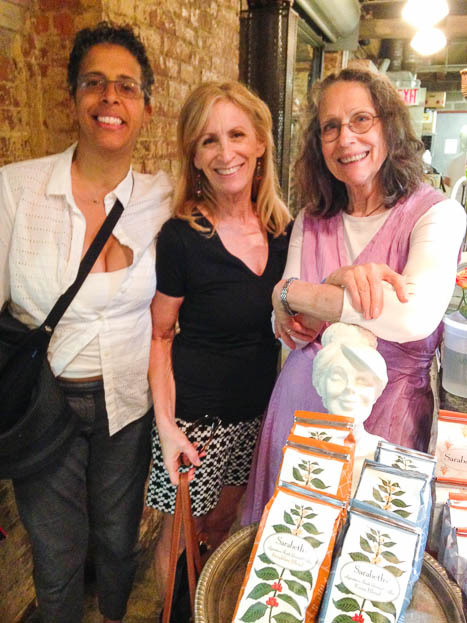 My highlight of Chelsea Market was meeting Sarabeth Levine at Sarabeth’s Bakery. Sarabeth started out making orange-apricot marmalade and through hard work and excellent products has become an award winning pastry chef. It’s safe to say that her mission of offering “simplicity, perfection and classic tastes” is, clearly, one that is practiced and not just preached. I swoon just thinking about the buttery cookies I ate from Sarabeth’s. I can’t wait to go back so I can try her velvety cream of tomato soup, cakes and tarts. I was a very happy lady to be in the picture with Jackie Gordon and Sarabeth Levine! 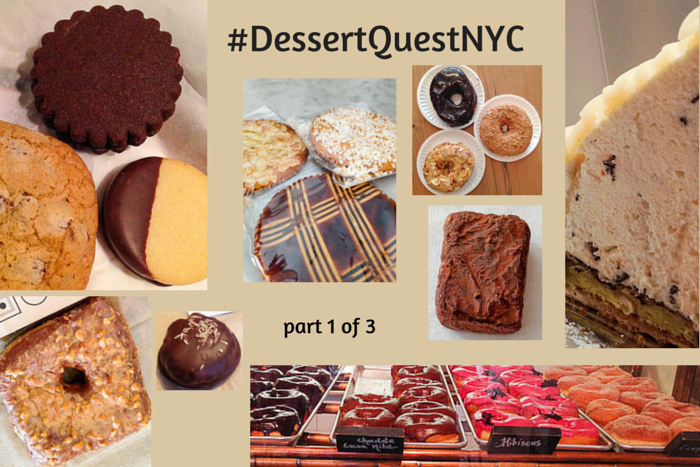 There were many more stops that Jackie, Susan, Devorah, Ken and I made so stay tuned for Part 2 of the #DessertQuestNYC story. The following is a list of where you can find the stops from Part 1. We did 2 of those, not bad since I’m not the maven of desserts!! I am impressed, Debra! Which were the two you tried? Sounds like the perfect trip! I will have to repeat your itinerary next time I’m in NYC! It really was, Barb. You will LOVE each and every stop! There’s only one problem with this posting: you didn’t invite me to join you. I’ve never seen more reasons to make a special trip back to NYC. No way will I hit all the places that you did but I won’t be too far behind. Thanks for every single review. Fabulous! Thanks so much. I am confident you will love each stop as much as I! !